Töging/Mallerstetten Festive Christmas celebrations at the Töging-based automation specialists of SPANGLER. No less than 16 employees celebrated a company jubilee and were honoured with some personal words at the Christmas celebrations. At the SPANGLER Christmas celebrations organised by the company, Managing Director Hannelore Spangler looked back over the past year. “2017 was quite demanding for us.” In particular the high level of orders, which is of course positive, brought many challenges. These were able to be mastered thanks to employee efforts. She thanked all employees for their overtime, inter-departmental support and taking over additional tasks. “The readiness of everyone to support changes is what keeps us together. I am grateful for the successful cooperation over the past year and proud of such a strong team,” she continued. Just how well the company sticks together was demonstrated by the subsequent awards to employees celebrating a company jubilee. 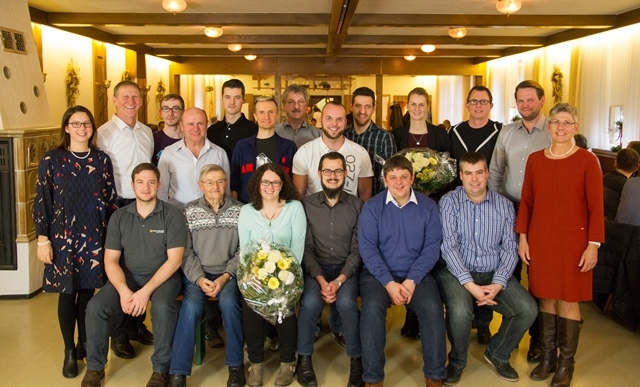 16 employees from all departments and occupational groups were honoured for 10 to 20 years at the company. SPANGLER sees long-term, durable and local relationships as the key to successful cooperation. With this in mind, it was decided to make a donation to the citizens foundation “Region Neumarkt”. This gives consideration to social responsibility in the region and its citizens, and supports people who have got into difficulties, often through no great fault of their own. In addition, the employees collected donations of both food and money for the food bank (“Tafel”) Beilngries and surrounding area. These were presented to representatives of the food bank after the collection had been completed. Representatives of the Beilngries food bank received the donations of food and money. A total of 16 employees were honoured for their long years of staff membership. SPANGLER Automation based in Töging in Altmühltal currently employs 130 people and has been a reliable partner for national and international machine and plant construction for more than 35 years. More than half the plants manufactured are exported all over the world. The medium-sized family-run business carries out planning for plant automation, programmes control systems and manufactures switchgears and control units for a wide range of different industries: environment technology, agriculture, construction, the food, automotive, raw materials and pharmaceutical industries. In addition, SPANGLER takes over initial start-up and after-sales service for plants.